M-Maji | Can mobile phones improve clean water access? 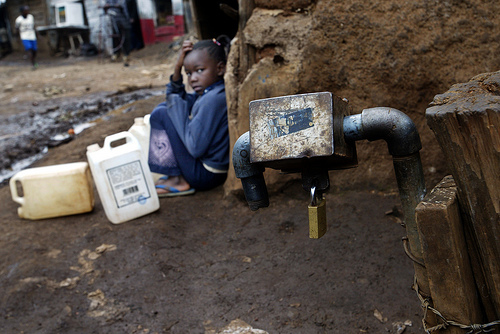 Water is scarce, costly, and contaminated in Kibera, Nairobi—one of Africa’s largest urban slums. On good days, the women and children of Kibera spend just under an hour finding clean water in their community. On bad days, the search takes all day and the price can increase tenfold. Water contamination is so common that people ask jokingly whether it is water or cholera they are buying at water kiosks. Many slums like Kibera lack access to clean drinking water, but they don’t lack access to mobile phones. This is the insight behind M-Maji (“mobile-water” in Swahili), a “mobile-for-development” project that aims to use widely accessible mobile phones to empower under-served communities with better information about water availability, price, and quality. awesome idea…simple but very powerful,especially accessibility from low-end feature phones: i think this will likely evolve into a vibrant location-based services platform that will open up this market to products such as micro-insurance.